Lately Facebook is all about cute videos and photos of cats, kittens, dogs and puppies and so on. To be honest I shared my favorites too! 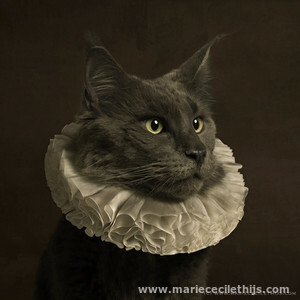 But Marie Cécile Thijs gave a new dimension to cats in her art photography. 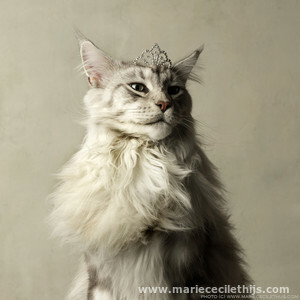 In her series Majestic, she created surrealistic portraits of majestic cats dressing them up with little crowns, and in her series White Collar she 'dressed' a cat up with a collar. 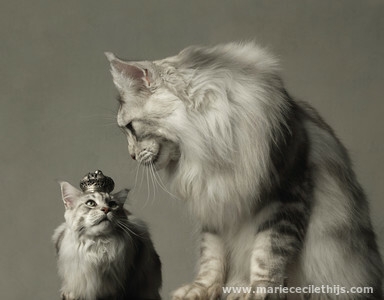 The Photograph Her Majesty has been awarded in the Masters Cup 2013 as winner in the category Fine Art. 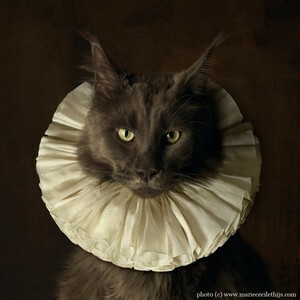 So do you think that I can dress up my stray cats for such an amazing art shoot? Marie Cécile Thijs is a portraitist with a distinctive signature. Her portraits are still lifes, and her still lifes become portraits. She is influenced by the old masters in painting, yet her work is clearly contemporary. Stillness is key. 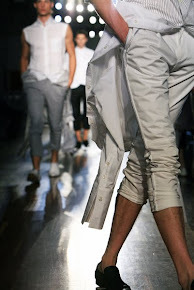 Marie Cécile Thijs, originally a lawyer, decided more than fifteen years ago to follow her love for the camera. She is specialised in staged photography, and created the series White Collar (including Cat with White Collar), Food Portraits, Chefs (Cooks), Horses and Human Angels, which are still in progress to this day. She also made many portraits of writers, politicians, designers and artists. Her work has often been published and exhibited, her photos have repeatedly received international acclaim and are included in the collections of the Rijksmuseum Amsterdam, Museum Rotterdam and many public and private art collections. Recently her book 'Characters' is published. 'Characters' shows a broad overview of the work that Marie Cécile Thijs has made over the last 15 years. Next to her highlights, also lesser well known and some yet unpublished works are incorporated in this book. There’s an introduction by writer and philosopher Désanne van Brederode.